WE NOW HAVE A PUMP TRUCK! WE HAVE COMPETITIVE PRICES AND WILL HAVE SPECIAL PRICES FOR OUR CONTRACT CUSTOMERS! WE NOW OFFER FINANCING FOR SEPTIC MODIFICATIONS AND SYSTEM REPLACEMENTS! Maintaining your septic system in good working order is a chore most of us would rather leave to someone else. And there’s no question it should be handled by professionals. Choosing the right service is critical. Without competent, professional maintenance, you could one day have a very expensive mess on your hands! And if you’re installing a new system, you want that same high level of competence in your installer. 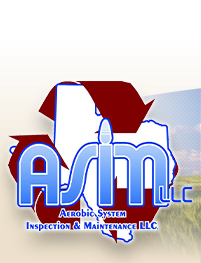 Aerobic System Inspection and Maintenance is committed to being the best in the business. For the past eleven years, we’ve earned the confidence of septic system owners throughout the Brazos Valley area with the quality, reliability, and thoroughness of our service. Our technicians are trained and we’re factory certified on most every aerobic septic system brand. We’re fully insured, and we’re happy to make appointments—something none of our competitors can claim!